Many of us have kids in our lives (sons, daughters, nieces, nephews, etc.) who see us engaged in programming and coding regularly. And as kids do, they love to be involved in things we’re doing. Here are ten ways you can get those kids involved! Kids can create and/or solve mazes without needing to be able to read or write or have any computer skills. Mazes in particular set a solid foundation for helping kids begin to form problem-solving skills. When the kid creates their maze and someone else solves the maze, they witness their commands taking effect in real time. A simple introduction to this concept is the card game Little Codr Game. With this game you are given a deck of directional cards (left, right, straight, back, etc. ), and the kid gets to pick out a set of directions, in order. Someone else (a parent, grandparent, etc.) then stands in a room where the game is being played, and they follow each directional step, in order. This allows the kid to watch the adult execute their commands. Board games are a great way to engage kids and keep them entertained while teaching them valuable lessons and skills. 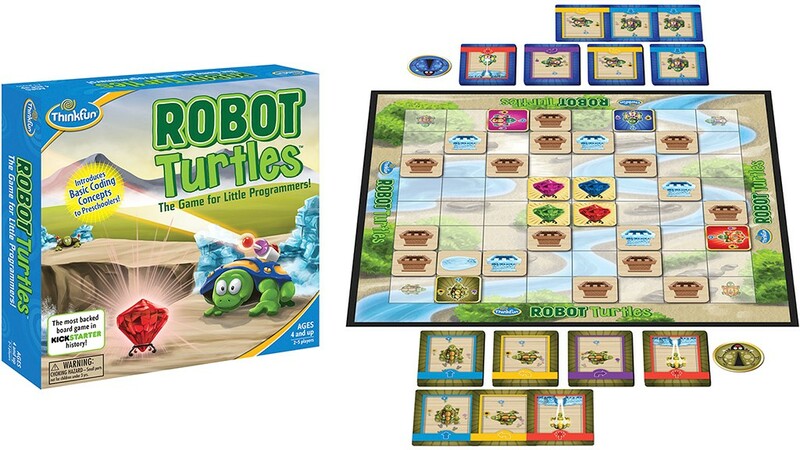 These board games teach kids the basics of programming without requiring a computer at all! Code Master, for example, is one of the board games from Think Fun. It teaches kids the basics of programming as well as planning, sequential reasoning, and problem solving skills. Designating a set amount of time for kids to learn new things helps keep kids (and parents!) engaged and makes it easy to plan for in busy schedules. The official Hour of Code is a non-profit organization whose mandate is making programming and computer literacy more accessible for everyone. With Hour of Code, kids spend an hour making their own games and programs either on their own or with a partner or teacher. Tynker is an online resource that provides interactive exercises, guided tutorials, fun creativity tools, and puzzles. Allowing kids to see the stories, games, and animations they’ve created lets them take their creativity even further. Educational applications like Scratch offer kids an animation programming language to help young people learn to think creatively, reason systematically, and work collaboratively while learning how to animate. Scratch also offers reference cards that you can print out with tips on things kids can animate with Scratch and instructions to use in the application. A great way for kids to feel good about the things they’ve been learning is by making something personal with the things they’ve learned so far. Whether it’s by using a tutorial, or starting from scratch, kids can make their very own web page all on their own! Companies like Bitsbox make it easy and fun to learn a coding language by providing a library for kids to take advantage of while learning to code with actual snippets that are able to be entered into a computer. With a Bitsbox subscription every month, kids also get accompanying items like books, toys, and stickers. Kids have all sorts of interests where coding can be introduced. Whether it’s books, contests, games, or courses, there is something out there for just about every interest. Having hardware to program and play with brings programming to life for kids. Kids can build things like a Pizza Box Phonograph or an Art Bot with an Arduino, a Weather Station or an Interactive Pixel Pet with a Raspberry Pi, or wearable eTextiles with a Lilypad. Robots offer an experience like having a programmable pet. Kids get to put the robot together the way they like then turn it on and watch it come alive! Whether they would like something familiar like Lego or are interested in something more modular like Cubelets, kid-friendly robots come in all shapes and sizes! One of the most impactful ways of reinforcing something a kid has learned is teaching someone else. Was Hour of Code fun for them? Well now they can host their very own Hour of Code! Do they like talking to other people? They may enjoy speaking at a community event or even a conference!